Today is the start of a series I've been planning for a few years now: a profile on winning Reds teams throughout history. We start with the first winning Reds team of the 1900's, the 1919 Cincinnati Reds! This is exciting for me; the way I have it set up, almost everything is automated with R, save for making a few of the pretty tables in Excel. This will hopefully allow me to put these posts together much quicker as I work through later teams. I'm looking forward to this tremendously. 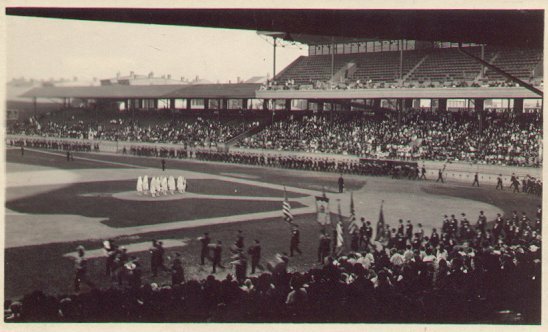 The 1919 Reds played in Redland Park, which opened in 1912. The 1919 Reds were the first Cincinnati squad to win their division since the franchise's inaugural team won the debut season of the American Association in 1882. This team's championship came at a really interesting time. World War I had just ended, and players were returning from service in the military. It was the end of the dead ball era. The next year, in 1920, with the exception of a handful of pitchers, spitballs, scuffballs, and shine balls were outlawed. With the death of Ray Chapman in 1920, baseballs were replaced whenever they became dirty or damaged to enhance their visibility (this also maintained their performance throughout the game, favoring hitters). In 1919, Babe Ruth broke the home run record with 29 home runs, topping Ned Williamson's mark of 27 from 1884. Ruth would crush that record the next year, slugging 54 home runs in 1920 to usher in the Live Ball Era. And, of course, the 1919 World Series will be forever infamous because of the Black Sox scandal, when White Sox players took money from gamblers to throw the series. Lost in all of that excitement was an excellent Cincinnati Reds team that featured an MLB Hall of Fame Center Fielder, 6 Cincinnati Reds Hall of Fame players, a roster full of brilliant first names, and, most of all, a legitimate claim to being the best overall team in baseball that season. The Reds entered the season having finished above .500 in two consecutive seasons, but with more than three decades having passed since they topped their league, be it the American Association or the National League. After a middling start, they finally started to turn it on in June, and climbed their way into a dogfight with the New York Giants that would last until August. Once August hit, however, the Reds finally gained some separation, and finished with an outstanding 96-44 (.686) record in the 140 game season. That's 52 games over .500! To maintain that winning percentage over a 162-game schedule in modern baseball, a team would need to go 111-49. While it's impossible to know how much the series was negatively tainted by the gambling operation that would be exposed a year later, the Reds were in control pretty much from the start. After slugging their away ahead mid-way through the first game, they would win four of the first five contests. While the White Sox came back to win the next two, the Reds would power their way to a 10-5 victory in game eight behind Hod Eller and lock in their first World Series championship. 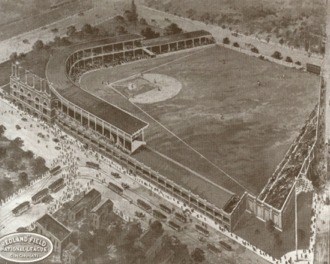 Redland Field opened in 1912 in the same location of the Palace of Fans. It was a deep park, with approximately symmetrical dimensions: 360 feet to left and right field, and 420 feet to center field. This was reflected in its 96 Park Factor, which put it in a tie for the best pitchers' parks in baseball that year along with Boston and Milwaukee. It had some interesting quirks, including a 15-degree sloping terrace in left field that angled up to York Street, which is visible in the photograph to the right just beyond the left field wall. The Reds played at Redland Field until Riverfront Stadium opened in 1970, though the park would undergo massive changes: additional seating, movement of home plate toward the outfield, the installation of the first lights in a major league park, and, of course, a change of name in 1934 to Crosley Field. 1919 Reds were unquestionably an elite-fielding team. 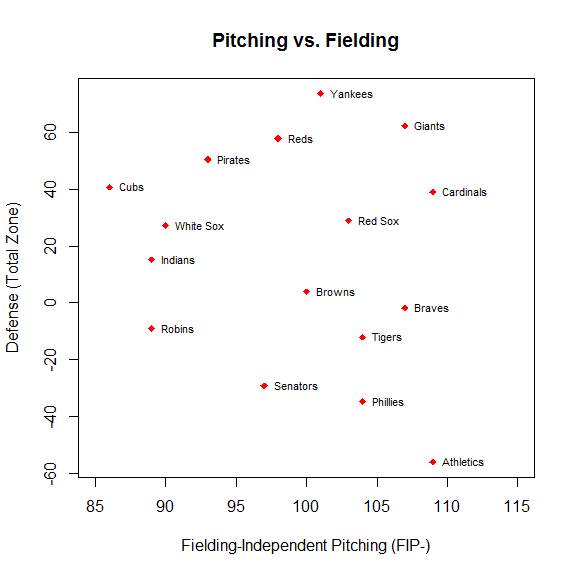 I also think, however, that when we're looking at Dead Ball Era teams, we need to be far more cautious about assuming how well fielding-independent stats tell the story. 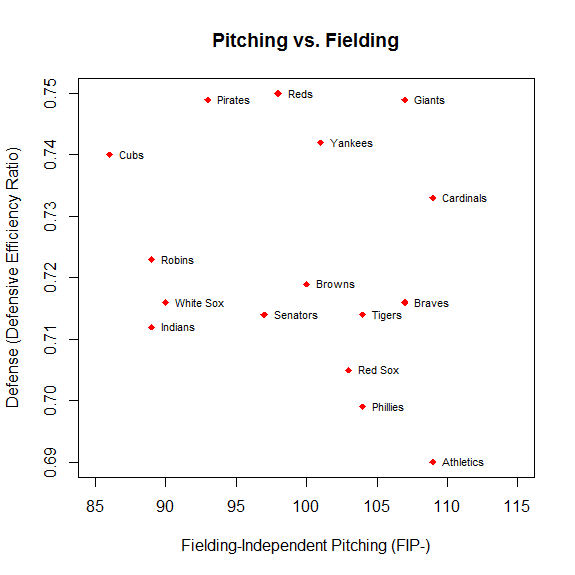 It's very reasonable to suspect that the DER numbers were aided by the ability of some Reds pitchers to induce weak contact, thereby increasing the Reds' ability to convert those balls into outs. 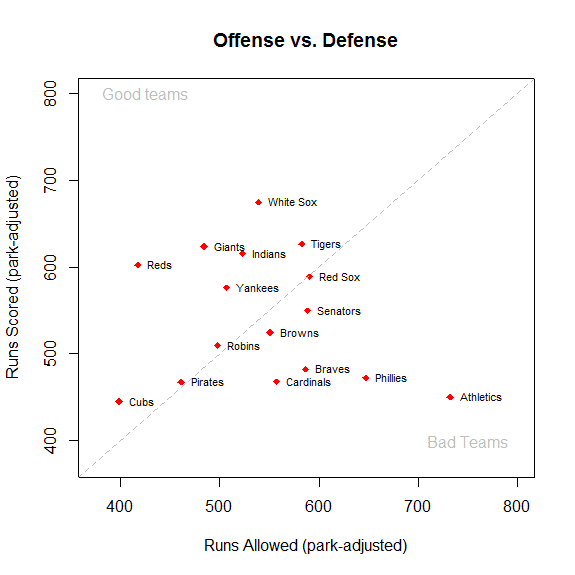 The 1919 Reds were not an elite offense. They played in Redland Field (later renamed Crosley Field), a pitcher's park (park factor of 96), and so their league-average OBP probably rates out as a tick above-average. They didn't have a ton of power, although this was still the Dead-Ball era; even the Red Sox, with home run champion Babe Ruth, had an isolated power below .100. The spread in ISO was about half then what it is now, and even now a point of OBP is worth about 1.7 times as much as a point of ISO. 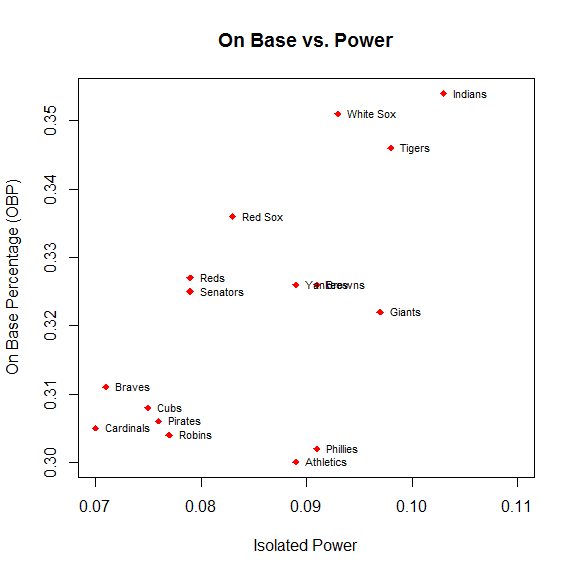 Power just wasn't that important in terms of how teams varied in the Dead Ball Era. Next up: 1919 Reds Pitchers!